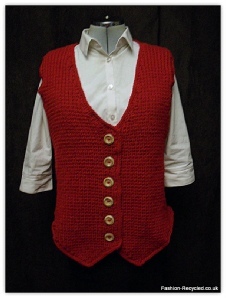 This is a great knitted waistcoat, the stitches create a uniform pattern with the crocheted edging setting it off. This is knitted using aran yarn so is lovely and warm. Please use these as guide measurements. Make time: 3 / 4 weeks after sourcing the yarn. This is a lovely lightweight sweater, which is comfortable to wear. 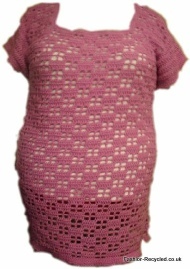 It is knitted using double knit wool and can be made in most colours. Make time: 4 weeks after sourcing the yarn. 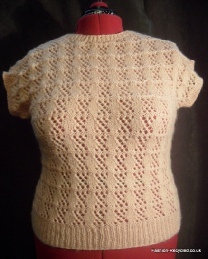 This is a lacy style lightweight top knitted in 4 ply yarn. 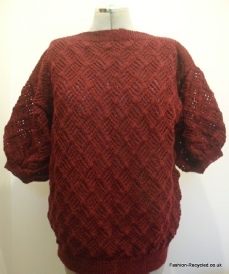 It has a lovely block pattern to the front and back with a boat neck. The sleeves are roughly 22 cm long in the photo but can be made longer if required. This top can be made in any 4 ply wool. This is my favourite cable pattern, it is knitted using aran wool and is lovely and warm during the winter. It is available for him or her and you can choose to have a round neck as shown in the photo or a polo / roll neck. This can be made in any aran wool, and has the cable twists going up the outside of the sleeves. This is a great top, it is available in the short version as shown in the photo or the longer version which is above the hips. 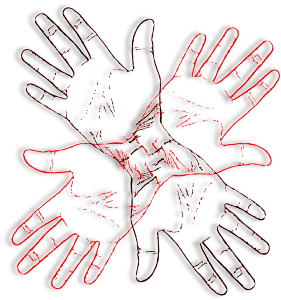 They are secured on the band by 3 buttons for the short one and 6/7 buttons for the longer one. They are crochet in 4 ply cotton which comes in a variety of colours, the one shown is metallic which is great for partying. I can make the straps for halter neck, cross at the back or just straight over shoulders. Make time: 2 weeks after sourcing the yarn. This is a great wrap over cardigan. 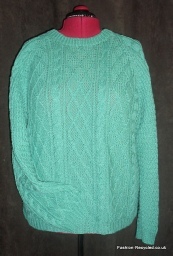 It is knitted in double knit wool and is available as short or long sleeve with an optional lace style edge. The cardigan is secured via a strap which ties around the waist. The ones in the photos were knitted using streamer yarn, so the colours are mixed in , You can choose any double knit wool for your order, please fill in the box with as much detail as possible. Make time: 3 weeks after sourcing the yarn. This is a great tunic, very lightweight. This one was crocheted using King Cole’s Haze yarn. It does stretch, so there is movement with in the measurements. This beautiful cape is great for the evening over your dress or as an extra for your wedding gown or bridesmaids dresses. It is knitted using long eyelash wool, which as you can see from the close up photo is soft, fluffy / furry, it is a lovely yarn. 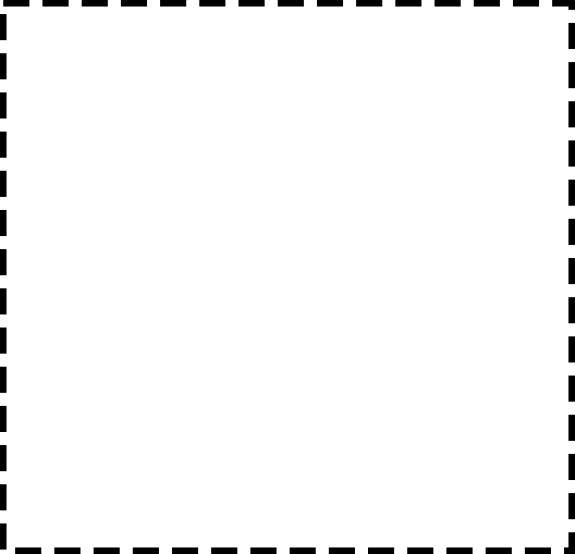 Length from back neck: 30 cm , 11 ¾ in. Manufactures for this yarn change, so I can’t list the colours here, please fill in your colour choice and I will contact you with the closest match I can find and the fibre content. I can make this cape lined or unlined, if you would like it lined it will be lined with a satin type material. Both the ribbon and the lining can be ordered matching the yarn or in a contrasting colour. The make time for this cape is 3 weeks from sourcing the materials, I have to order this wool in. This beautiful bolero jacket is a great addition to any outfit. It can be made in different patterned lace and in different colours. It is trimmed with satin binding. You can have long, short, or no sleeves, different binding colour or the same, with lace material or solid, the choice is yours. Because there is so many variations for this item, please e-mail me with your requirements.